A day in the field for Justin Suca begins at 4:45 in the morning, just before the first stars begin to disappear from the sky over the island of St. John. He’ll spend the next five hours motoring around the reefs south of that Caribbean island, retrieving tubular nets full of fish trapped during the night. The fish are much too small to eat or sell, but Suca doesn’t throw them back. He and other scientists from Woods Hole Oceanographic Institution (WHOI) are there to count tiny larvae, often less than a centimeter long. The nets intercepted the larvae as they made their harrowing trip from the open ocean where they hatched, to the reef where they would settle down and live. Suca and colleagues are there to understand how they find their way home. The larvae travel almost blind, swimming overnight through dark waters, so they must rely on other senses. Rich chemical clues about the flora and fauna on a reef can disperse miles through the water, but Suca says the fish would have trouble relying on their noses to guide them home. Smell can travel a long distance, he said, but it’s hard for fish swimming through swirling pockets of odor to discern which direction the smells are coming from without integrating other senses. So Suca is focusing on how the larvae use another sense: sound. Last fall, Suca, a graduate student in the MIT-WHOI Joint Program in Oceanography, joined the lab of his Ph.D. advisor, Joel Llopiz, a WHOI biologist who studies the early life stages of commercially and ecologically important fish—from herring in New England ponds to the mind-numbing diversity of fish on the Caribbean reefs of St. John. 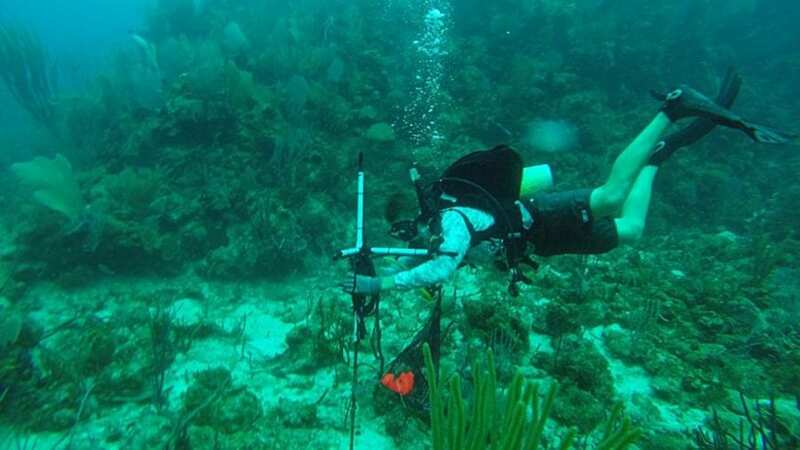 These booms and busts can throw off the balance of vegetation cover, predator populations, and even coral growth rates on reefs. “So if you just change a little bit during the egg or larval stage, it can have huge effects,” Llopiz said. Many of the fish that make their homes in the crevasses and cracks of St. John’s reefs and other reefs around the world don’t hatch there. Instead, they emerge often miles from shore and drift in the currents. Somehow, soon after the larvae stop drifting aimlessly and learn to swim, they find their way back to settle on reefs. These are the fish interdicted by the tubular contraptions that Suca pulls from the morning waters. 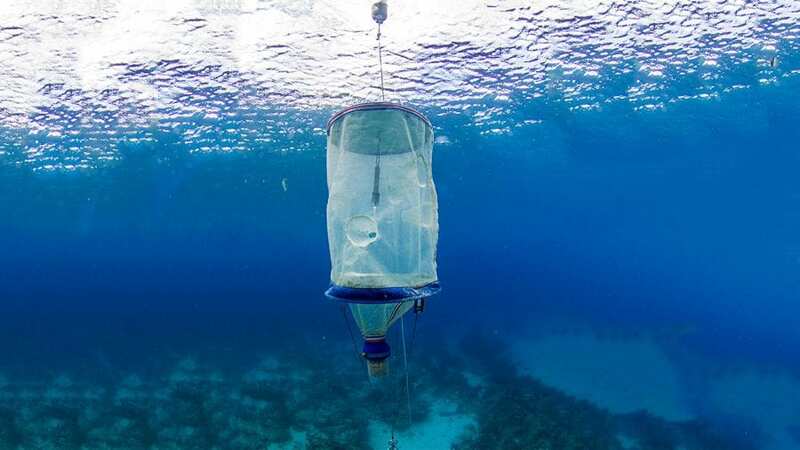 The light trap—a cylinder of plastic netting with a light inside—looks almost like an elongated bug-zapper and functions on a similar principle: the light attracts nearby fish larvae. The larvae pulled from these traps may be tiny, but under magnification, their translucent bodies and strange shapes look like they might have come from some alien sea. And indeed, the sea they experience is a strange one to us. For the larvae, zooplankton offer a feast, but schools of sardines become swarms of ravenous predators. “They are small and vulnerable; they have to eat and not be eaten,” said Suca. To survive in the open ocean, fish larvae have many adaptations, often making them look completely different from their mature counterparts. “You can almost equate it to a caterpillar becoming a butterfly,” said Suca. 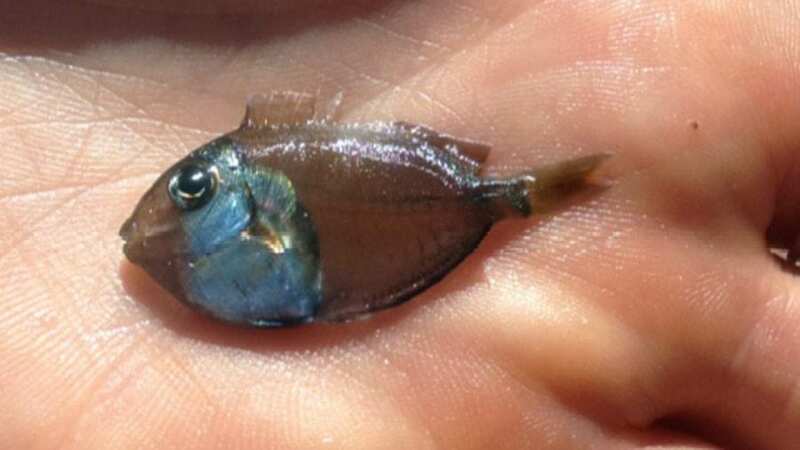 While some adaptations help the fish larvae catch tiny zooplankton more quickly, others keep them safe from the sardines and anchovies that are the larvae’s greatest threat. 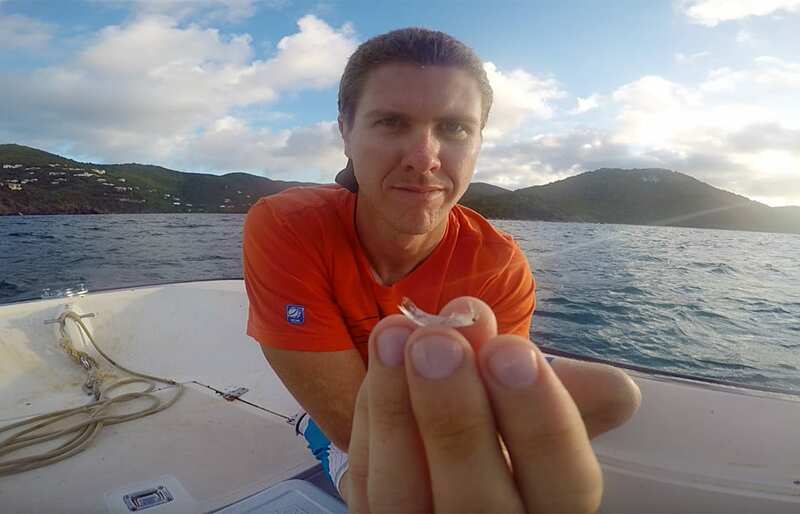 “A favorite of mine are squirrelfish larvae—they have a really long spike that just spits out the front of their head, and another that goes back,” Suca said. This spike can double the length of the larval fish—and thus the size of the mouth a predator would need to eat it—until the fish grows larger and the spike disappears. 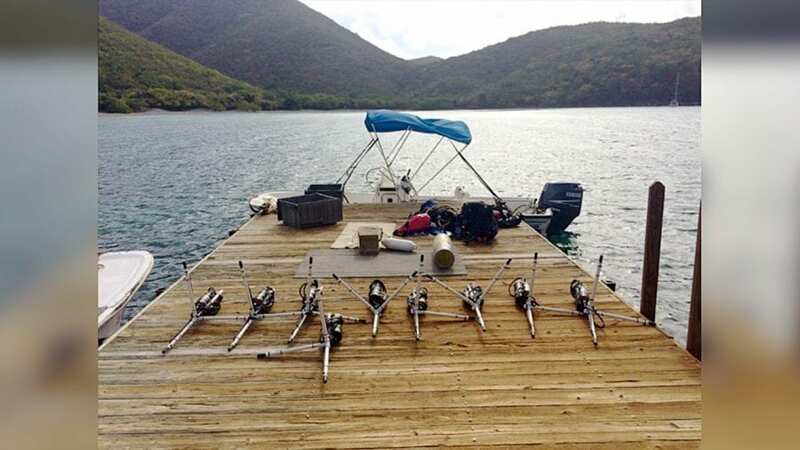 After returning the traps to shore and having lunch, the team’s day has only begun. They’ll strike out again that afternoon, gathering the data that will hopefully explain why various species show up in one light trap but not in another. Spaced among with the light traps are recording devices, set along the reef months ago by the team. To preserve power and space, the recorders awaken every ten minutes, for only a minute at a time, sampling the reef’s soundscape through cycles of day and night, moon phases, and seasons. In the afternoon, Suca will dive to gather these recorders, offload a season’s worth of sound, and replace them so they can keep recording until the team returns in a few months. Most terrestrial dwellers hear by using eardrums that detect changes in the air pressure caused by incoming sound waves. Fish don’t have eardrums; instead, they hear using six tiny bony spheres, embedded in fluid-filled chambers in their head. When a sound wave hits a fish, its body moves with the water, dragging the stone along and bumping it against the tiny hairs that line its sac. It’s through this way of “hearing” that fish find their way close enough to shore to be able to search visually for their new homes. But what do they listen for? The deep grunts of groupers? The higher-pitched snapping of shrimp? Perhaps they avoid the grunts, which may signal that reef cover is near, but could also warn of predators. Different taxonomic groups may be drawn to different soundscapes, just as they settle on the reef at different times of the month or year. This means that to correlate soundscape with fish settlement, the scientists need to collect larvae for weeks, every few months, for years. Llopiz is especially interested in whether fish are more attracted to the sounds of a healthy reef or an unhealthy one. If the grunting of large fish calls larvae home, then dying reefs—which need fish to eat the algae overgrowing them—wouldn’t attract new fish. If he can figure out what “home” sounds like to a fish, Llopiz has what he calls a pie-in-the-sky idea to help sick reefs by attracting the right fish back to them. “Could we put out a speaker on a reef and rebuild it up to a healthy reef?” he asked. If so, whispers in the dark water, guiding millions of tiny larvae, could be a reef’s salvation. Suca’s own journey to the reefs of St. John includes a fair share of time spent in the ocean. Growing up in Sarasota on the Florida Gulf Coast, he’d been fishing on the open ocean since boyhood and was SCUBA-certified in high school. Just before college, he began spearfishing in the reefs off Florida, diving without a tank or breathing apparatus to come face-to-face with his quarry. Suca is also an amateur birder, and in the field, it’s not all work all the time. In their limited daylight hours on shore, Suca and colleagues find time to enjoy land-bound activities as well—birding, perhaps an afternoon on the beach, or a hike up Ram Head, a peak jutting off the southeastern tip of the island offering nearly 360-degree views of the ocean. “The terrestrial life is beautiful here, too” said Suca. Before the sun sets that night, Suca and the others will set out again, this time to replace the light traps, preparing them for another night of collecting fish. While the humans sleep, the recorders will awaken every ten minutes to take another sample of the surrounding sound. The fish larvae will begin again their instinctual journey from ocean to home along the shore, unknowingly deciding, in their massed movement, the fate of the reefs toward which they swim.